Your wedding is going to be one of the most magical days of your life and you want to make sure it is special and memorable. It is easy to see why many wedding budgets are now upwards of £30,000, but you don’t need to spend that much to enjoy a fabulous day. The key is to choose where to spend your money wisely, and try and save in other areas. Your wedding ceremony is one of those areas which can easily be overlooked as many couples don’t realise that there is a need for entertainment during certain sections of your wedding ceremony. There are four main parts of your wedding ceremony which benefit from background music and these are: while your guests are being seated; as the bride walks down the aisle, signing of the wedding register and walking back down the aisle as a married couple – also known as the recessional. It is important to have background ambience to these parts of your wedding ceremony, otherwise it can get a little quiet! If you want to keep things very simple and on a budget, there is always the option of playing a music CD during these parts if your wedding venue has a cd player / pa system but did you know that hiring musicians to play during the ceremony really isn’t that expensive and is a worthwhile investment for a wedding ceremony you won’t forget! Using our website you can easily find the perfect wedding ceremony entertainment and we’ve put together our top suggestions if you want to keep things romantic! The most popular type of live entertainment for during a wedding ceremony is that of a String Quartet. String Quartets offer a stunning sound, and usually consist of the following string instruments: two violins, a viola and a cello. Combining these instruments gives a well-rounded, melodic sound which we feel is perfect for during your wedding ceremony. Not only does a String Quartet sound majestic, but also offers a visual performance too as musicians look very elegant as they play their instruments. 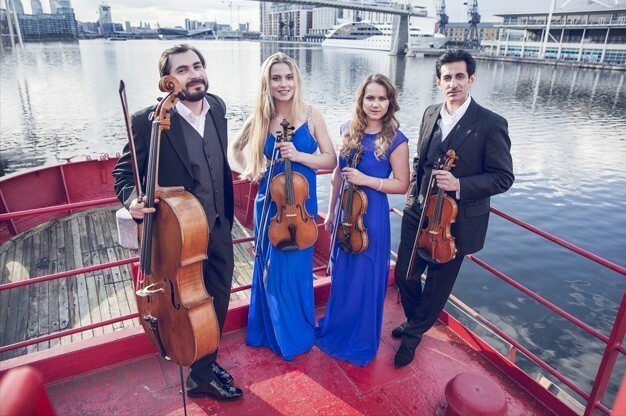 This type of entertainment offers a very intimate performance and you have the option of sticking with traditional classical music, such as the wedding march, or Pachelbel’s Canon in D. Alternatively, if you would prefer instrumental versions of modern hits, this can be arranged and many String Quartet’s will have a massive repertoire to choose from. If you would like to book a String Quartet for your upcoming wedding ceremony, click here to view our selection! 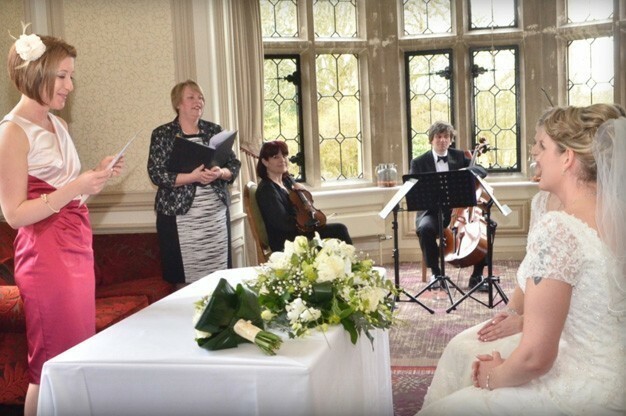 Although String Quartets are a sought after choice for wedding ceremony entertainment, we know that not everyone can afford such a lavish expense. If you need to keep things to a budget, why not opt for a string duo instead which will offer a similar performance, but with less musicians! A string duo can be formed of any two string instruments, such as a violin and cello, two violins, or any number of other combinations. The sound that is produced from a String Duo is still very beautiful and another benefit is that they take up less space for performing so if your venue is on the small side, it might be more suitable to book a String Duo. Offering a selection of classical and modern hits, create the atmosphere of live music without stretching the budget! Click here to book a String Duo for your wedding ceremony today! Cello music offers a deeper and richer sound that is very characteristic and we have a number of cellists available to book for your wedding ceremony. 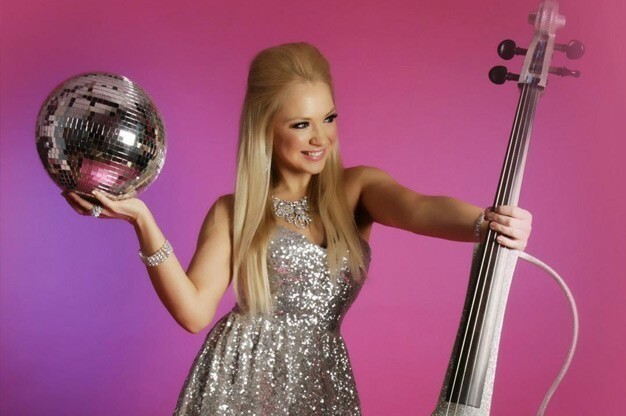 A cellist also offers both the perfect sound for your wedding ceremony, but a visual performance as they perform with their instrument and they take up little space too – making them perfect for intimate venues. Watching a cellist perform either classical masterpieces or modern hits from the likes of Coldplay or Adele will add a certain elegance to your wedding ceremony and will make it very memorable as you relive those moments through your wedding photography and/or videography. If you would like to browse our selection of Cellists available to perform, click here to access their dedicated category! It is well known that piano music is well loved and it’s easy to hear why when you listen to a beautiful collection of piano music being played. Did you know you can book a pianist / keyboardist to perform at your wedding ceremony, even if your venue doesn’t have a piano on site! Most pianists / keyboardists will supply their own equipment – even baby grand pianos! Choosing piano music for your wedding ceremony gives you great control over the style of music you wish played during your entrance and other important parts – many pianists can happily perform not only the traditional options and more modern hits but you also have the option of jazz music too which can offer a very different feel to your wedding! 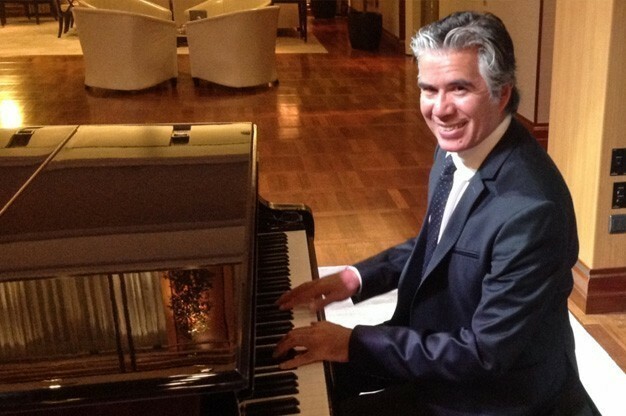 Want to find a pianist or keyboardist near you to perform at your wedding ceremony? Click here to browse all of our available entertainers! 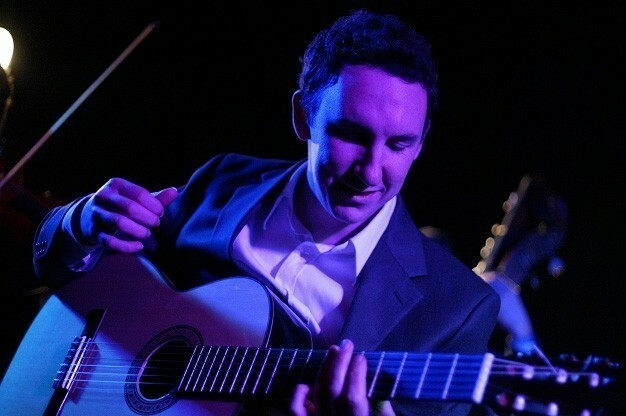 Switching back to another string instrument, we couldn’t suggest romantic wedding ceremony entertainment without recommending the Spanish or Classical Guitarist! A Spanish or Classical guitarist will play gentle music as they pluck and strum on an acoustic guitar and this makes the sound they offer very romantic. Usually, a Spanish or Classical guitarist will also offer a selection of songs to choose from including the traditional favourites in their repertoire. Opting for this type of wedding ceremony entertainment will give you and your guests a very mellow background ambience without being too overpowering. Click here to find a Spanish or Classical guitarist using our entertainment directory right now! Here at Entertainers Worldwide we help you take care of all of your entertainment needs for the whole of your wedding day and if you would like to try and save even more money when choosing wedding ceremony entertainment, why not see if your chosen performer can perform during your wedding drinks reception and / or wedding breakfast too for a “bundle” deal!? We have so many other options when it comes to instrumentalists & musicians listed on our entertainment directory, such as solo violinists, harpists, saxophonists, bagpipers and more so browse through our website to find the perfect choice for your wedding ceremony! When it comes to the other parts of your wedding, such as your evening reception don’t forget that we offer magic and illusion acts, comedy acts and live bands too – including our very own wedding bands section along with many other types of live groups and bands! We like to make things easy for you to find the right entertainment and we offer our services to you at no additional cost to yourself! Want to Save Time When Booking Your Entertainment? Sit back, relax and have your Entertainment contact you! By adding a post to our website e.g. ‘String Quartet required for Wedding Ceremony on 12th August’, our available acts will contact you by email. Look at the Entertainer’s publicity, decide which is your favourite and contact them directly! The entire service is completely free of charge. Tell us what entertainment you are looking for now and we will do the rest! Click below to Create a Profile with us & promote your Act / Event Services now! Any questions?